It is well accepted that β1 integrin plays a key role in maintaining normal podocytes form and functions; however, its mechanism of the potential protective effect remains unclear. Furthermore, the investigation and understanding of the non-lipid-dependent renal protection of Statins in addition to well-known lipid-lowering effect may provide the therapeutic utility and ultimately improve clinical outcome for patients with renal diseases. In the present study, we investigated the effect and mechanism of fluvastatin (FLV) on the expression of β1 integrin in puromycin aminonucleoside (PAN)-treated podocytes in vitro. Cultured human podocytes were treated with PAN, and/or different concentrations of FLV (1 × 10−8–1 × 10−5 mol/l), superoxide dismutase (SOD), or H2O2, respectively. 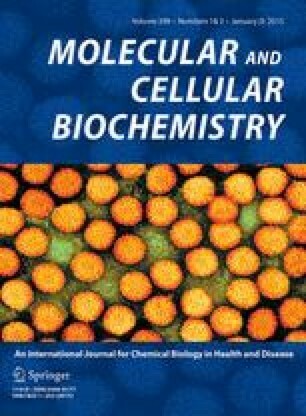 The expression of β1 integrin and reactive oxygen species (ROS) in human podocytes under each experimental condition was evaluated by western blot, RT-PCR, and 2′7′-dichlorofluorescein 3′6′-diacetate, respectively. The viability of podocytes was also assessed by MTT colorimetry in the present study. The expression of β1 integrin was significantly decreased, and the synthesis of ROS was significantly increased in podocytes following either PAN or H2O2 treatment (p < 0.05). The up-regulation of β1 integrin and down-regulation of ROS were also observed in PAN-treated podocytes following lower concentrations of FLV or SOD treatment (p < 0.05, respectively). The cytotoxicity data derived from MTT assay revealed that lower podocyte viability was found in the presence of higher concentrations of FLV, PAN, or H2O2. Lower concentration of FLV or SOD can protect podocytes from being impaired by PAN treatment. FLV attenuated the podocyte injury induced by PAN and increased the production of β1 integrin in human podocytes in vitro. This underlying mechanism of FLV may be through inhibiting the activity of ROS in human podocytes. Jia Liu and Bo Zhang have contributed equally to this work. There is no conflict of interest to declare.